In 1983, Return of the Jedi marked the end of the original Star Wars trilogy, and with it, an incredible era of effects innovation in film. The movie wrapped up all the story threads previously set in motion — Luke’s journey to become a Jedi, the Rebellion’s struggle against the Empire, and the redemption of Darth Vader — and did so amidst a backdrop of stunning visuals, thrilling action, and lots of strange creatures. From speeder bike chases to lightsaber duels to a trip inside the tunnels of the Death Star, Return of the Jedi is still a spectacular entertainment. In honor of the film’s thirtieth anniversary this month, StarWars.com spoke with Industrial Light & Magic’s Dennis Muren — the effects legend who worked extensively on Return of the Jedi and the entire Star Wars trilogy — about the early process of getting started on the film, why beams of light shine from a melting carbonite slab, and where Jedi stands historically. 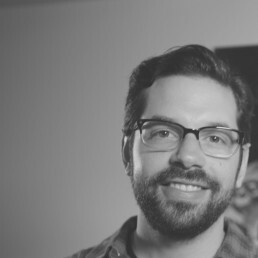 StarWars.com: I wanted to start at the beginning. The Empire Strikes Back is finished, and then what’s the next step for you in terms of getting started on Return of the Jedi? 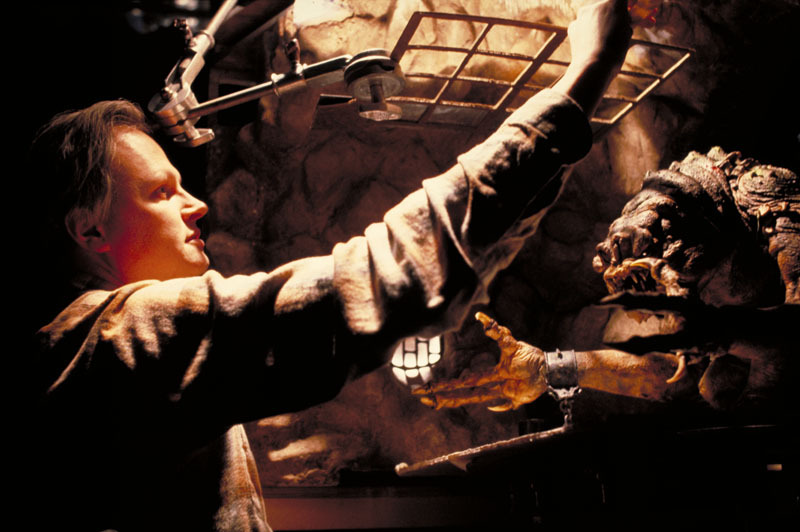 Dennis Muren: I went onto Dragonslayer and E.T. And as I was doing that, work had already begun on Jedi, but I wasn’t working on it because I was finishing those films. Ralph McQuarrie and our art department had already been here with Joe Johnston and a couple of other guys. They were doing artwork on it. George [Lucas], I’m guessing, told them ideas and maybe gave them a little treatment or something, but probably didn’t show anybody a script. They knew there were a lot of creatures in it, and they got Phil Tippet to head up a creature shop — to actually make one internally in Marin County here, because there were going to be so many creatures that were going to be in this show that were not in the other two. So that went on, I’m guessing, probably a year or so before they moved to England and started shooting. I can’t remember quite when I came on to it, but I think they’d already been shooting. I just finished a shot in E.T. and had to jump on an airplane and fly over to do some blue screen stuff for the rancor pit creature. Then I came back and finished the stuff we were doing in E.T. That’s the way these shows usually go. 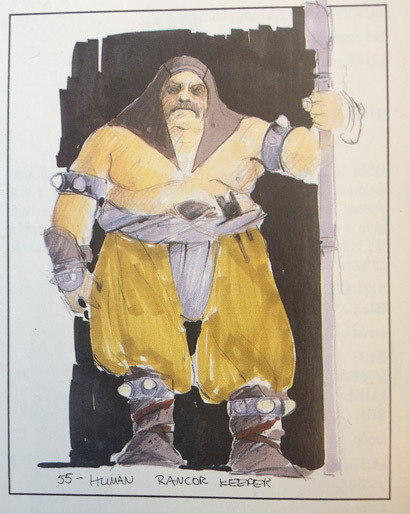 On [Return of the Jedi], because there was so much work from an effects standpoint, we split it into three sections. I did most of the land stuff and the forests, and I think a few other things. Richard Edlund did the desert stuff and also I think the big final attack on the Death Star, and Ken Ralston did most of the other big space scene sequences. And the stuff I did, also, was stop-motion. There was stop-motion here and there. That just meant we could each be focusing on a smaller number of shots. I mean, it was a huge show, shot-wise, and it just made sense that you could focus more on each shot and make it better if you weren’t dealing with too many shots. 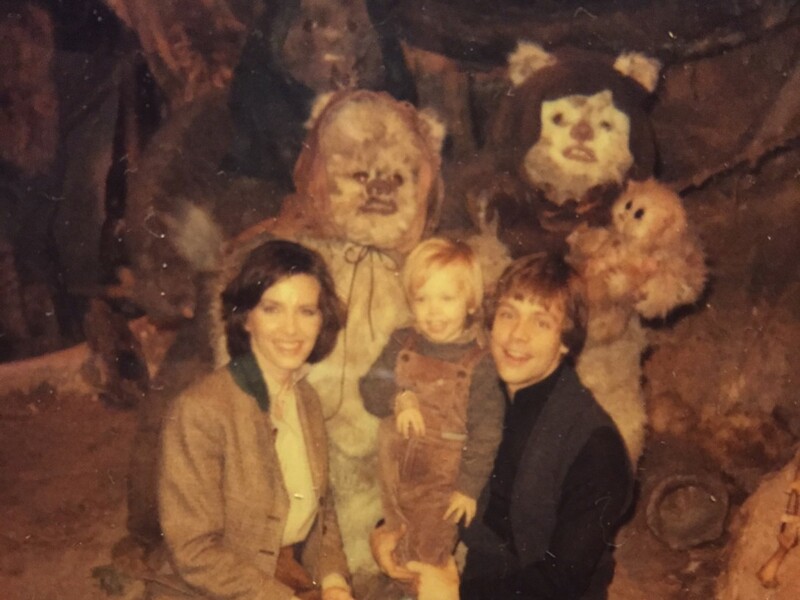 StarWars.com: And when you finally got involved, were you given a script, or just the scenes that you had to get done? Dennis Muren: Man, I couldn’t tell you. I probably didn’t see a script. I probably just saw the pages at that point. 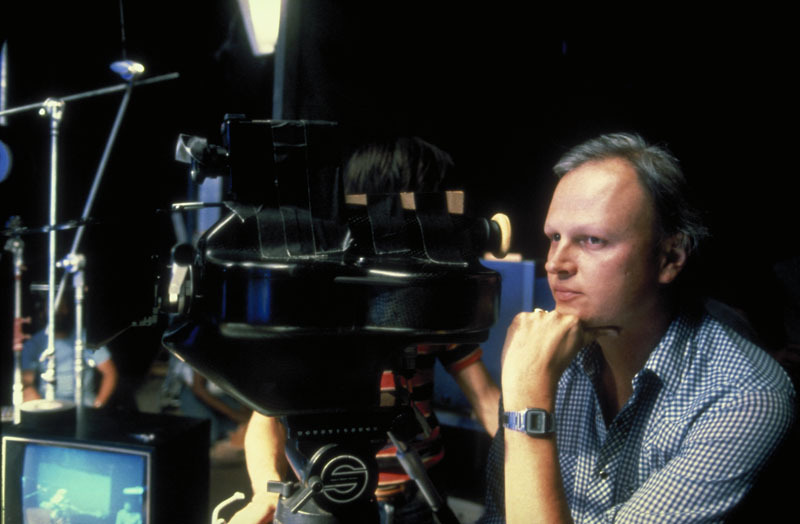 Dennis Muren: I felt exhausted from barely finishing E.T., because that was a pretty tough show and a pretty tiny show. And we had no money on that. We were really scrambling to get the thing done and make it look good. But it seemed huge, and there were a lot of problems that needed to be figured out. I remember we did location scouts up to the redwoods [forests in Northern California]. That was for a lot of stuff — the speeder bike chase, the battle, and the walking machines, stuff like that. I went over to England two or three times, but very briefly. So from then on, from my point of view, it was like, “How are we going to do these shots?” I know the bike chase had 100 [effects] shots on its own, and I probably had another 200 or 300 shots. It was a pretty big show, and we kept enlarging ILM. Everything was limited to how much room we had, and yet there was so much work that we had to do things based on camera availability and crew between the three units. StarWars.com: Was it particularly stressful? How was it compared to working on Empire and Star Wars? Dennis Muren: It was not nearly as difficult as Empire or Star Wars, because we had done it before. By that time I had worked on four films, and I was working on Dragonslayer and E.T. Star Trek was in there, Raiders [of the Lost Ark] was in there, Poltergeist was in there. So by the time we got to Jedi, we had done a lot of work, and we had a lot of equipment. We were really set up and we knew how to do it, and then it was a matter of doing it. That was a big problem on Empire and Star Wars. We weren’t really sure how to do it. On Empire, we had to train the crew, and we didn’t have enough camera gear or anything to get the show done. StarWars.com: And you were kind of inventing how to do it as you were doing it. Every one of these could have been a disaster if one of them didn’t work, because George put his own money into it. Nobody wants to see anyone go through something like that. To take a risk like that is pretty brave, and he set up a great place for us to work and gave us a lot of freedom in order to be creative. 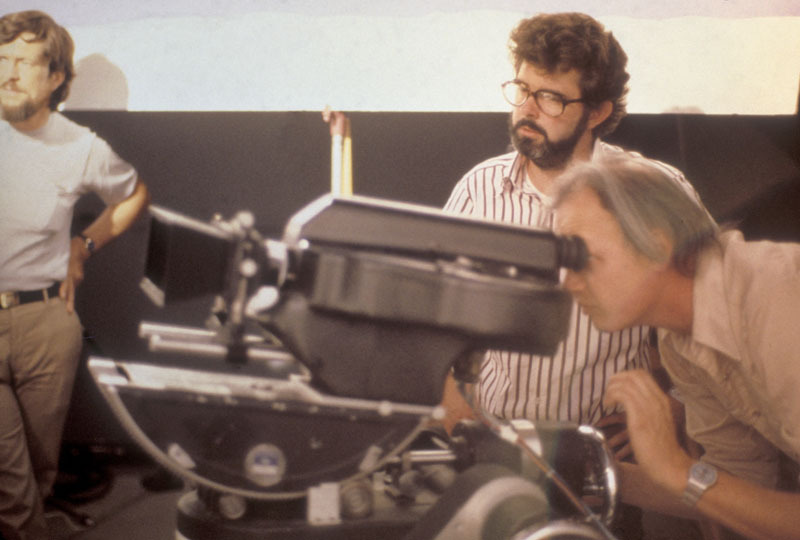 StarWars.com: Can you talk about working with both George Lucas and Richard Marquand on the effects side? How involved were they? Dennis Muren: You know, I don’t really have much memory of Richard. I remember him being around. [Laughs] I’m sure we had communications on things, but the communications were pretty much with George because he knew us all and Richard didn’t. He just knew what he wanted and knew what was important and wasn’t important. Richard was very nice and deferred to him, at least in front of us. It was even the same on Empire with [Irvin] Kershner. 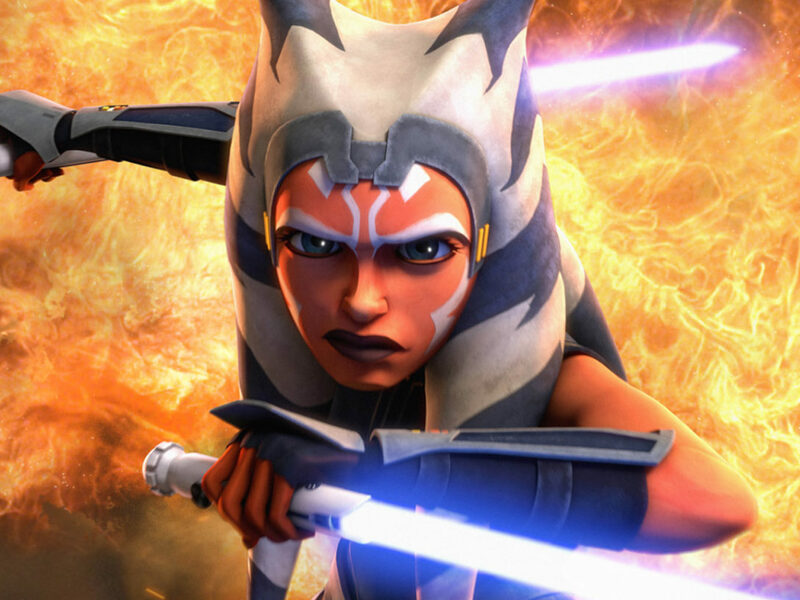 StarWars.com: You were talking about how creature-heavy the movie is, and I feel like that’s one thing people really love about Jedi. It’s very practical effects heavy, and movies aren’t really made like that anymore. I think it was a different time. There’s thought now, especially in the industry, about going back to that. Whether the audience is going to go for it… I mean the young audience, I don’t mean the older audience. Is the young audience going to buy that, or are they just going to laugh at it, nobody quite knows until that comes out. I think if it’s done right, people are going to like it. What doesn’t work is when something looks fake. That just dismisses everything as far as I’m concerned. StarWars.com: Whether it’s practical or it’s digital. Dennis Muren: I actually, in some ways, prefer a practical thing that doesn’t look right. I can’t relate to a digital image [that looks fake]. I don’t feel like I can touch it. If it’s done right, it’s great. I totally love it. It’s just that there’s so much work that the industry has had to do lately and the budgets have been cut so much, there’s not enough time to refine it. I don’t think that’s very good. I still like seeing something and thinking, “Hey, they tried.” I feel that if I reached out, I could touch that thing. 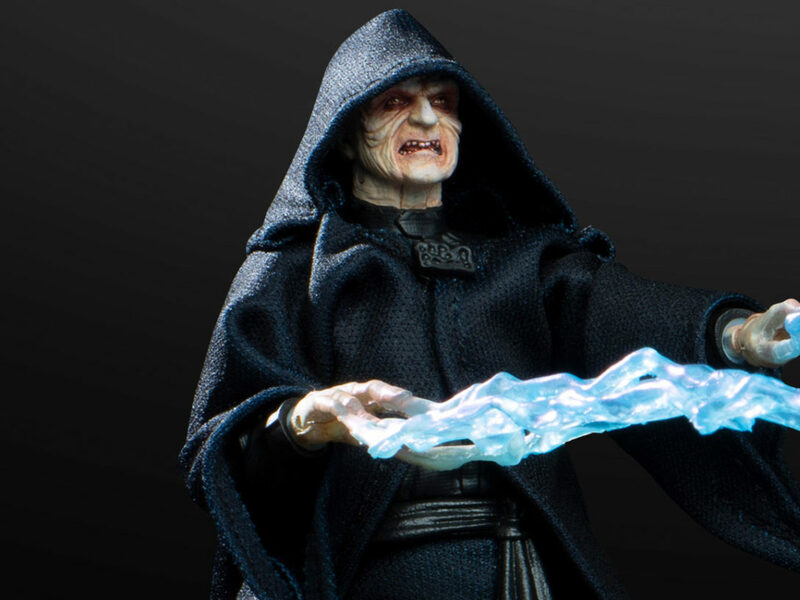 StarWars.com: I’ve always felt like Jedi has a handmade quality. Dennis Muren: Yeah. Right, handmade. That’s exactly it. Not pixel-made. But you know, I’m waiting, and I know you can do great work with computers. At some point, people are going to look at computer stuff as handmade in some way. The younger generation is doing that. I am a very big fan of computer graphics if it’s done right. StarWars.com: I wanted to go through a few specific effects shots from Jedi, and see if you can talk about how you pulled them off. Dennis Muren: That’s when all the beams of light shoot out and everything? Dennis Muren: That was Phil and I working on that. I can’t remember which one of us came up with the idea. I think it was either done with heat or with stop-motion. I can’t quite remember which we did, but we did it many, many times to break those pieces off. It’s kind of a crazy thing — glowing from the inside. I don’t know why there are all these shards of light coming out. Dennis Muren: Yeah, it looked good, and it sort of hid what was inside, I think. That may be part of what we were trying to do by having it be bright. And it’s funny how that’s been copied in so many movies since then, where something’s supposed to happen and these shards of light come out in straight directions. And it’s not like someone’s dying, not in that kind of movie, but in some transformation. But I remember, logically, it didn’t seem to make any sense. But it looked nice. StarWars.com: Sometimes that’s all you need. Dennis Muren: Yeah, right. Why is everything originally from a point? Who knows, who cares. Dennis Muren: We tried that originally with a guy in a suit. George thought that might work, and Phil and I were thinking, “This will never work.” But as we got into it, we made a suit that a couple of guys could work with. It was one creature but really being controlled by two people inside of it. It was as big as a person actually is, so it was not a rod-puppet or anything. And it started looking pretty neat, but George pretty quickly said, “No, this is not going to make it.” And we were pretty exhausted, especially me, and I’m sure Phil was, too, from doing go-motion. We didn’t want to go into it for that, and I was always pushing for something different to get rid of the chatter for stop-motion. I think Phil came up with the idea of doing it with a rod-puppet. And that was kind of good. We could hide the rods in the darkness and set the shots up to look like the creature was big. To get the performance out of it, we did all sorts of… Right away you’ve got Phil or someone’s arm up in this creature. Right away it looks like it’s a muppet or a hand puppet. Even when you’re a kid and you stick a sock puppet on your hand, you know what that looks like. It’s embedded in your mind, and this looked like that. We saw that, and we did everything we could in every shot to have it not look like that. Shooting high speed, shooting slow speed, or shooting things backwards, because bodily, your muscles work differently. The film has got a lot of those shots in it, and most of it we tried to do without doing any matting, because I was not a big fan of matting in those shots. So we did them actually in the camera, except for a couple of shots in there. And we could control the light and the haze and everything on it. And that was kinda good. It was not really a big sequence. It was a tiny little set with five people jammed into it. StarWars.com: Was it easier to do once you decided on that technique, as opposed to a person in a suit or stop-motion? Dennis Muren: You know, stop-motion probably would have been actually the easiest. It’s time consuming, but you kind of know what you’re going to get. It’s harder for the animator, and that’s not me, but I think the results came out a lot better with what we ended up doing with rancor. I mean, every time I see it, and I haven’t seen it that much, I feel very limited in what it could do. I want to be back looking at it more, and I want to see it just doing something, and it doesn’t. And it’s because it can’t. With that technology, that’s the most it could do. And that’s all it really needed to do, anyway. StarWars.com: The speeder bike chase. Dennis Muren: That, we knew was going to be blue screen stuff, because we had the actors riding these things. But I wanted to be able to have a lot of control over the camera and the motion of the speeder bikes. So I didn’t want to do a lot of blue screen stuff. We ended up building smaller bikes for most of the shots that were like a foot and a half long or so, about a foot tall, with puppets on them, that we could shoot from a distance. So I could get the long shots and make the choreography look good. And then [for] the closeups, the choreography’s not as important. That’s where you have the actors. The harder part of that was figuring out “What do we do with these hundred shots, or 103 shots, in three minutes?” Because it’s so much work, and I didn’t want to have to shoot 103 different backgrounds for this, where most of them are just blurs racing by. So we did an animatic of it with a little digital video camera that had just come out, that you could hold in your hand. All of them are small now, but this was the first one that had been made about the size of a sort of big paperback novel. That was something small that you could just move around easily. So I got the idea of just making a little set, with GI Joes and little figures, and little cardboard tubes painted brown for trees, and a shag carpet on the ground that looked like forest floor. And just do a really quick custom animatic for it. We did that. We did some shot designs first, Joe and I, then George embellished them, and then we shot this whole thing as an animatic. Then I kind of disassembled it to see what the shots looked like. And I figured out, after all this deconstruction of what we were going to do, that we only needed a few shots looking forward or backwards, and a few shots from the side. Then there were probably about 10 or 12 custom difficult shots. Maybe a few more than that, but not much. Because the bikes were going to be blue screen, the backgrounds didn’t require that many different shots to do, because we could use them over and over again. We could run them backwards, we could flip them left and right, and they would all look different all the time. I didn’t want to spend all this money building a model forest, because you had to go through this at like 100 miles an hour. I got the idea to do it with a Steadicam. I don’t know whose idea it was. But I called Garrett Brown up, who invented it, and he flew out from back east and we did a test out in Samuel Taylor Park out here, with him just walking along with the camera, shooting one frame a second. And the thing worked. The problematic shots were the front views and the rear views, because you couldn’t see a road. The other ones we could do from driving a car along the forest and looking out to the side. But you couldn’t do front and rear views [like that], and [the Steadicam] meant we could do those. So essentially, we spent a few days in the redwoods just shooting one direction, always just going forward in four or five different locations, and from those picked the best few shots, and did side views and three-quarter views. We built a little forest for one shot we needed. So, that gave us all the backgrounds a lot more efficiently than if we had done it one shot at a time. Just basing it on a lot of reusing of shots, which is something I’d also done for the Walker sequence [from The Empire Strikes Back], which isn’t as apparent. A lot of the Walker sequence we did in Empire, because we were so behind in getting that show done, was reused elements, reused backgrounds, reused everything. [Laughs] That’s sort of what went on with this, also. StarWars.com: I also thought it was interesting that in the final cut, there’s no music during that scene. So you’re really focused on what is happening. Dennis Muren: Right. I can’t remember whose idea that was. It was either Ben [Burtt]’s, or John Williams’, or George’s. But I think it was really nice. I’ve seen it in a few other films, too. It’s so good when they do that, because it breaks it up. 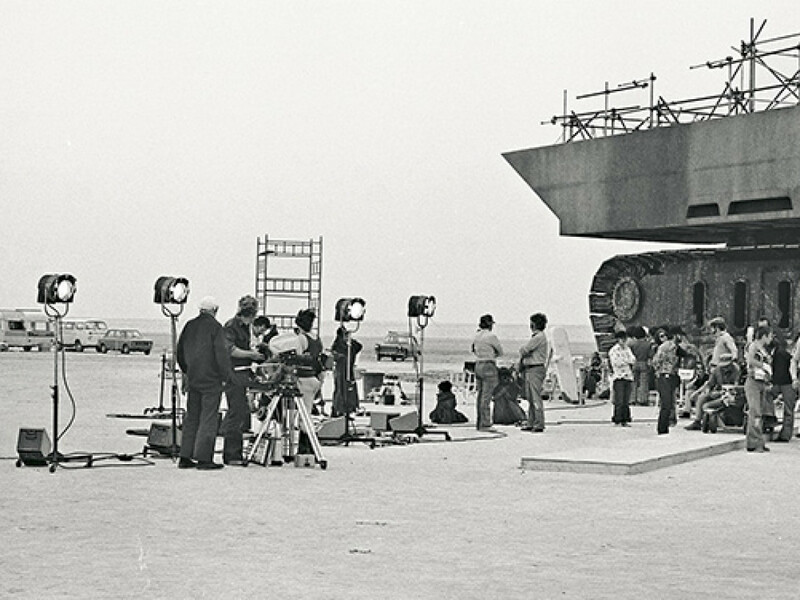 StarWars.com: You’ve been involved in and witnessed major advances of special effects over the years. What is Jedi‘s place in all of that, if you can sum it up? 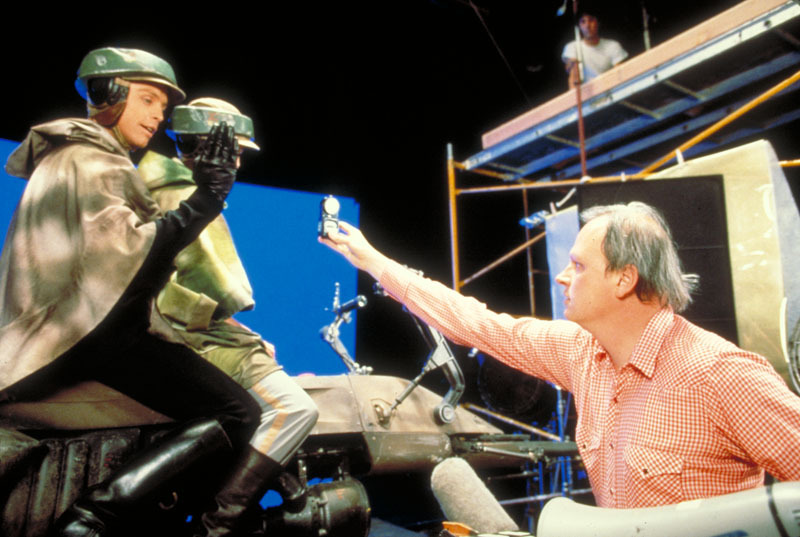 Dennis Muren: Well, I think that really was sort of the peak of the first evolution of effects that came quickly with the start of Star Wars, which is motion control and refining blue screen compositing to a level that hadn’t been done before. I think [Jedi] is technically the best show of all three of them. The stuff just looks more realistic, and it’s because we had the time, the equipment was there, and we were refining things, but we weren’t building them all from scratch. I don’t know if there’s that much more of an improvement between then and like 1990, or 1992. Our toolkit was kind of there then. StarWars.com: Return of the Jedi is such a great example of what you can do with puppetry and practical effects. At a Jedi screening this month, Mark Hamill said that for Episode VII, he would like to see a balance of handmade models and practical effects with CGI. What are your thoughts about that? Dennis Muren: I don’t know how it’s gonna go yet, but I think everybody’s got their way of looking at it, and I think we want to give something that people want to see. And I think what Mark’s talking about is something that a lot of people are talking about. If it’s gonna work, if it’s not gonna be laughed off the screen… You know, Mark and I, we’re not young whippersnappers, and we’re not nostalgic. Is an 18-year-old or a 15-year-old or a 25-year-old going to feel the same way? That’s part of what’s got to fit into the equation here. On the other hand, if it were to be CG, it can’t look like CG. You’ve got to think, “Oh my god, that is the greatest mask that’s ever been made, but I don’t know how it’s moving.” And we’ve seen that in many movies, but you remember the bad ones. 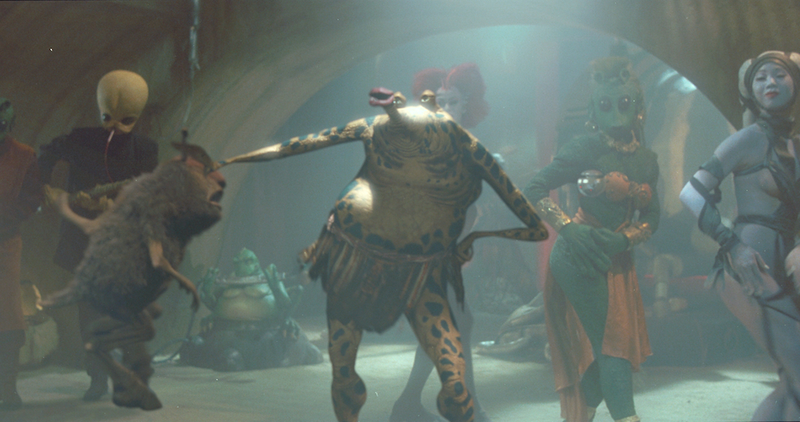 There’s a lot in Phantom Menace and other films that just look amazing. So, a combination sounds like a good idea to me, but who knows. It’s too early to say. StarWars.com: Looking back on Jedi thirty years later, how do you feel about it as a movie and about your own work that you put into it? Dennis Muren: I was so exhausted making it and I was exhausted looking at it, but I think it was a really good conclusion. It was aimed a little younger than I was used to with the Ewoks, but I thought technically the whole thing came out really good. 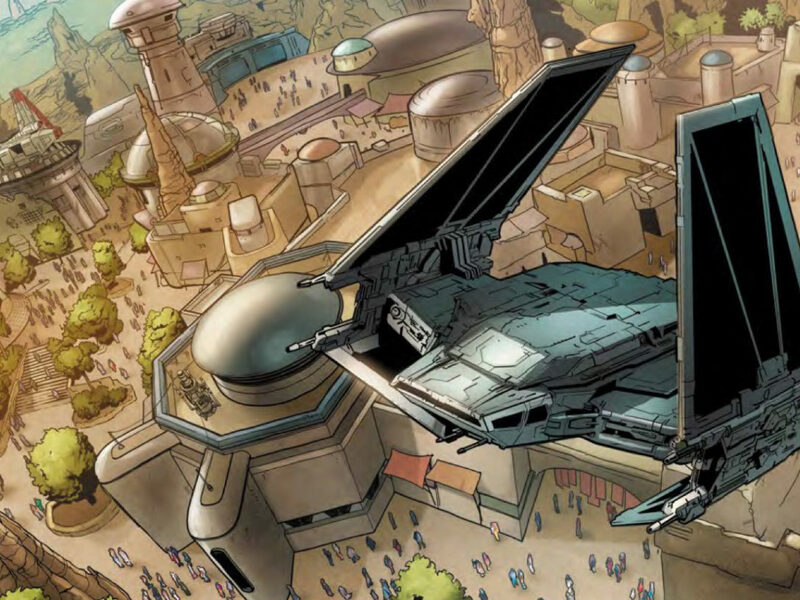 My favorite is still going to be Empire, and I don’t know why, but most people think that, too. 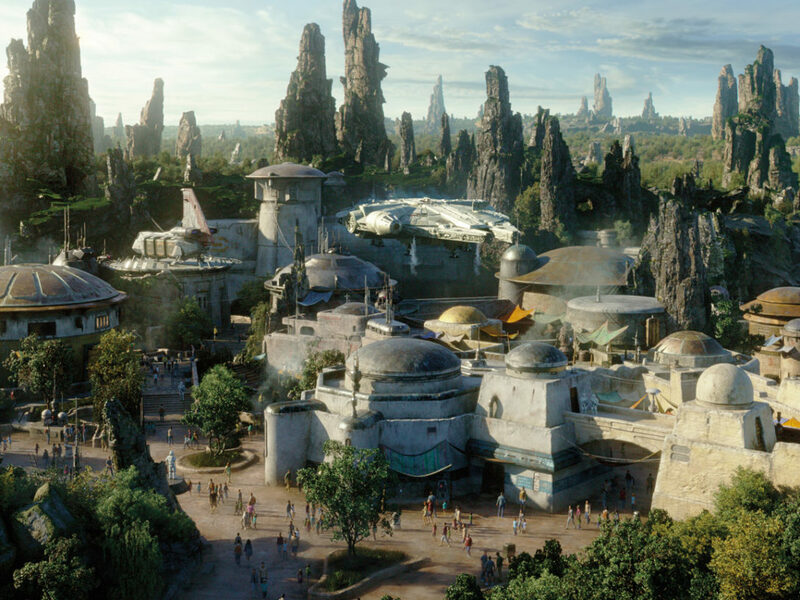 StarWars.com: What I find is that for a lot of Star Wars fans, when they’re growing up, Jedi is their absolute favorite. And then when they’re a little bit older, it turns to Empire, but everyone still has a warm place for Return of the Jedi. Dennis Muren: Yeah, I wonder why that is. And I’ll never know it. I’ve never seen those movies the way anyone else saw it, because [I] worked on it. But I’ve heard that before. It’s really interesting. When it first came out, people were saying, “Boy, that is really a terrific film.” And we were kind of scratching our heads. We just weren’t quite sure. Not that we didn’t like it. Maybe it was because it did wrap things up, and we wanted things to keep going.